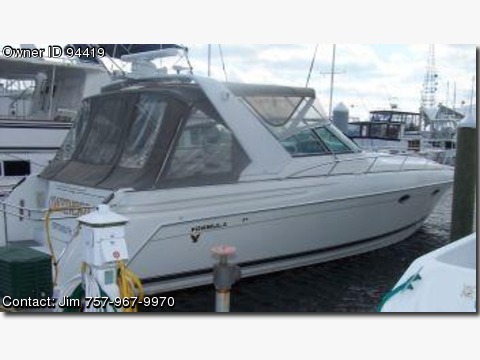 Call Boat Owner Jim 757-967-9970 757-513-1191. Description/Condition This 41PC is the flagship of the Formula product line with every option available from Formula, with the Formula quality and performance. She is in mint condition inside and out with all the luxuries you could ever want in a performance cruiser. The Twin Volvo Penta TAMD 74 diesels deliver 480 HP each, they power this cruiser, to top speed of approximately 36 mph, with an ultra economical fuel burn rate. Cruise faster, further and with less fuel. Special Options is the concealed Hydraulic lift arm for PWC storage and removeable AFT Railing to extend cockpit area. With only 450 hours, this is a must see boat. The only reason for sale is to clear debt. Accommodations: Enclosed front cabin with private entrance to head, Queen size aft cabin, and salon table that converts to a sleeper. Full head w/stall shower and vacu flush toilet. Gally: Full size galley with two burner range, microwave, full size refrigerator, ice maker, and Twin A/C-Heat units, Central Vac. Electronics: Fully integrated Raytheon 4' array radar, GPS chartplotter, simrad auto pilot, VHF and compass. Kenwood AM/FM 10 Disc Cd with helm Remote. Electrical: Twin 30 amp shorepower feeds with Kohler diesel onboard Gen-set. 80 AMP auto battery charge, lube oil pump and 6 batteries. Deck: Full canvas, bimini, aft curtains, cockpit cover, remote search light, concealed windless, dingy davit,and bow sunpads.